Gout is a painful form of arthritis caused by excess uric acid. As the uric acid builds up in your body, crystals form in your joints, causing pain and inflammation. Heredity, diet and other factors can lead to gout. For instance, people who suffer from metabolic syndrome or who are recovering from a traumatic accident are more susceptible to gout, and gout is more prevalent in older adults. Though more men suffer from gout, women can have gout, too. Avoiding certain foods that cause an increase in uric acid can help decrease gout symptoms. Compounds found in some foods called purines break down in the body to form uric acid. So a diet for gout sufferers relies on foods with low levels of purine. Some high-purine foods or purine-producing foods to avoid include fried foods, alcohol, fatty foods, organ meats, herring, mackerel, scallops and high-fat snack foods such as chips. Though nuts can be high in fat, they don't contain purines and aren't off limits for gout sufferers. H.K. Choi, a rheumatologist in Boston wrote in a study published in the March 2010 issue of "Current Opinion in Rheumatology" that nuts, along with beans, whole grains, fruits, vegetables and dairy products are healthy foods for gout sufferers. A diet that includes these foods could even help prevent the recurrence of gout. If you're overweight, getting your weight under control could reduce your incidence of gout. Excess weight increases your risk of gout. Nuts are a high-calorie food, so you'll want to limit your intake of them to avoid consuming excess calories. 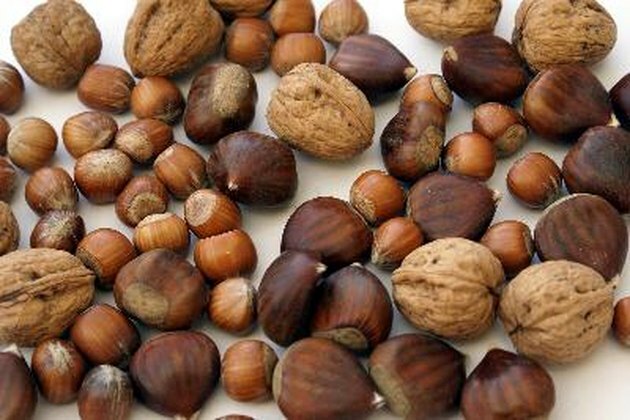 Don't cut out nuts altogether. Eating 10 to 15 nuts a day could actually help you lose weight, by regulating blood sugar and giving you a boost of protein and fiber. If you suffer from gout, consult your doctor about diet and treatment options. Your physician may prescribe anti-inflammatory medications to help with the pain. If you have gout you may also be susceptible to kidney stones and may have additional dietary restrictions to prevent stone formation.